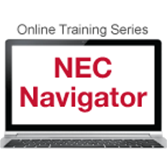 New NEC Navigator™ Online Training * lays the groundwork for efficient application of NFPA 70®: National Electrical Code®. Everyone who designs, installs, or inspects electrical systems or equipment needs to know their way around the National Electrical Code. Developed by NFPA®, the Code source, this self-paced online training offers a vital introduction to using the NEC® to locate requirements correctly and efficiently. Solidify your skills through scenario-based exercises that allow real-world practice of each step. Complete this 1.5-hour course and qualify for 0.15 CEUs. Upon successful completion of a course, participants will be prompted to download the CEU certificate directly from the course site.